Towards the end on 2010 I had a telephone call from Valencia in Spain. 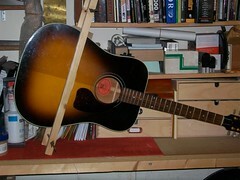 It was an owner of a Gibson J 30 acoustic who explained that he was having a problem with the soundboard on the guitar. He described how the soundboard was lifting badly behind the bridge, which was causing the bridge to “ride-up”. This, in turn, was causing a high playing action. My first question was to ask if there wasn’t anyone in or around Valencia that could repair the guitar; Spain being the land of the Classical guitar with a Luthier on every street corner. 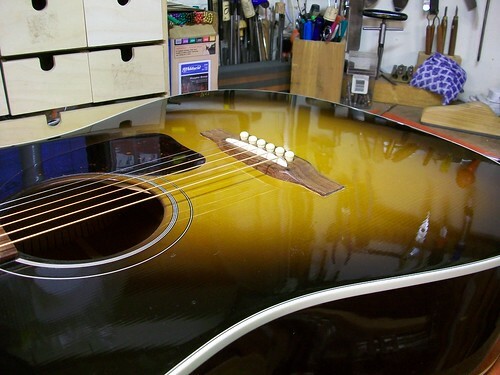 I was interested to hear that American-made steel strung guitars such as this J 30 were outside of the local Spanish Luthiers comfort zone and their ethos to such a problem is: “If in doubt replace the soundboard”. 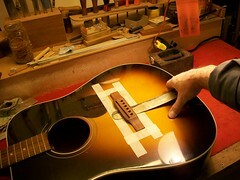 Which conveniently side-steps the issue and also would change the guitar’s identity and characteristics forever. After exchanging a few more ideas and discussing the possible causes of the problem I agreed to take on the repair. 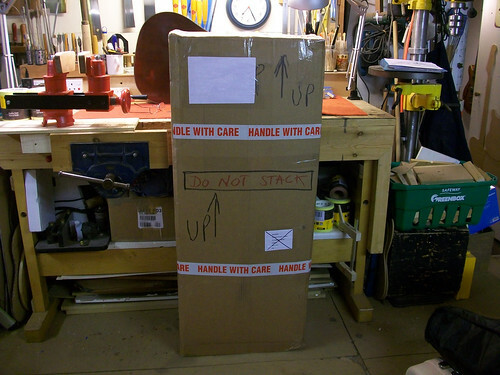 Several days later the guitar arrived by special carrier and I was able to take an in-depth look. The bellying problem is shown in this photo. With further investigation I was able to discover that the J 30 was (possibly) an experimental model by Gibson using a parabolic soundboard. This made me sit up and listen! Was the soundboard supposed to be this shape? 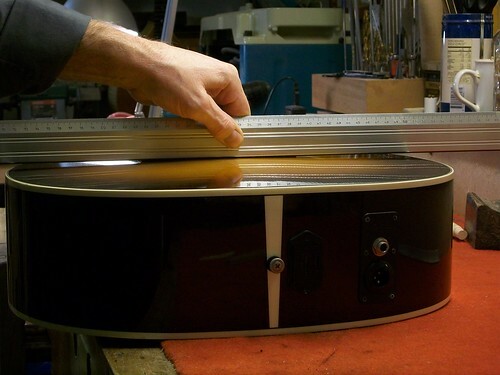 All soundboards have a slight curve built into them to help with strength and stiffness. It would appear Gibson flirted with the parabolic idea on the J 30. However, if this shape was built into the design it wasn’t working very well. The neck angle is correct; therefore this is not a possible cause. 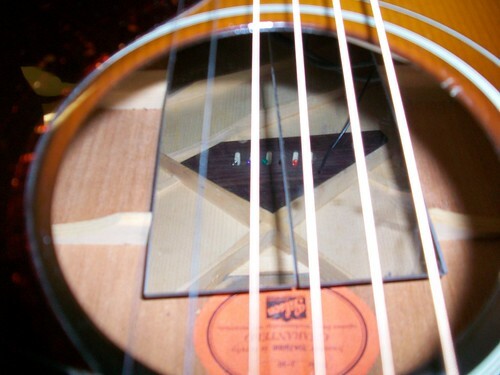 This photo is taken through the sound-hole and shows a mirror image of the bridge plate. The size of the plate certainly could contribute to the bellying problem. 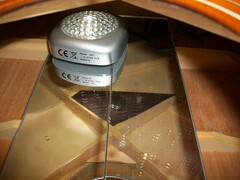 In this photo of the soundboard, you will notice a very wide growth-ring pattern. 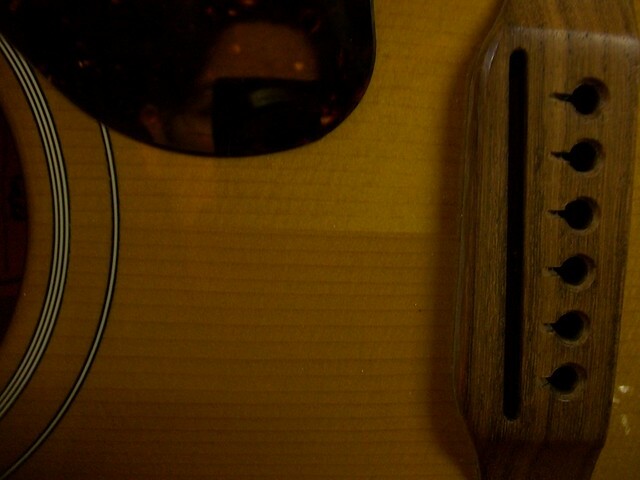 Without writing a lengthy explanation as to why this could add to the problem (perhaps another time) it must suffice to say that the tighter or closer together the growth-rings the stronger the soundboard. 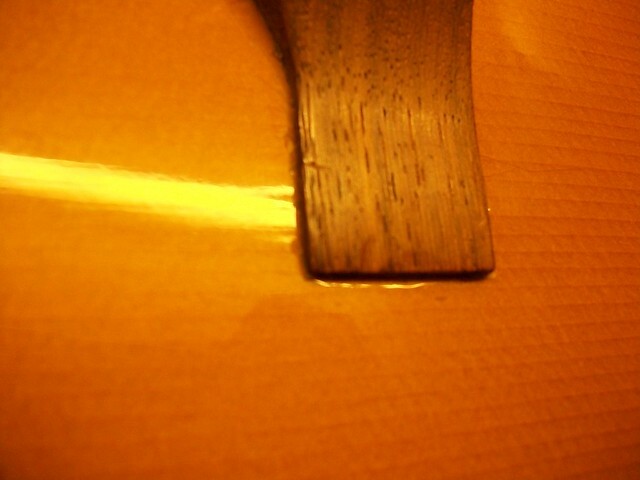 Therefore this very wide growth-ring pattern could contribute to the deformation in the soundboard. Here’s a close-up of edge of the bridge. In this photograph stress lines have formed around the bridge wings. This could be due to the rotating effect of the bridge at its extremities or a loose brace. 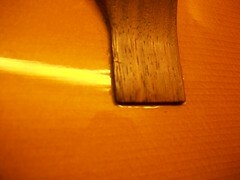 There is nothing that can be done with the soundboard quality apart from following the Spanish Luthiers advice. However, the soundboard could be gently eased into a flatter parabola. The internal braces are checked: all in order. 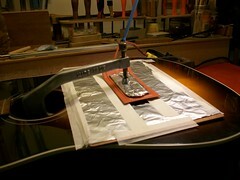 The bridge and bridge-plate are gently moistened and heated. 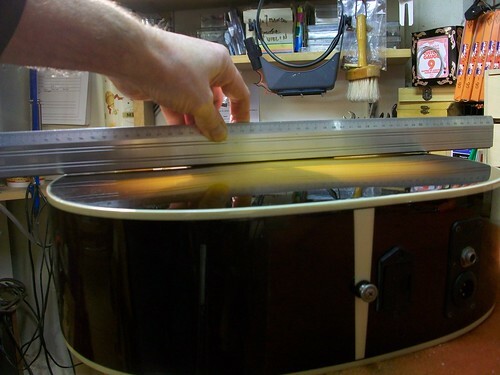 This softens the glue and ensures easy removal. 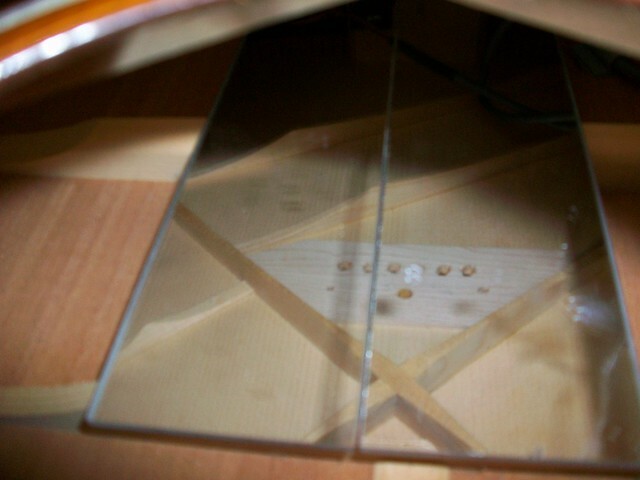 Once removed and while the area of the soundboard around the bridge and bridge-plate are in a “moist” state, the soundboard is gently eased into a flatter shape. It is left to dry-out in a quiet part of the workshop for a few weeks. A new bridge-plate is made up. This is designed slightly larger, slightly thicker than the original and is made from quarter-sawn Rosewood for extra sturdiness. After several weeks of drying-out time the new Rosewood bridge-plate is glued into place. 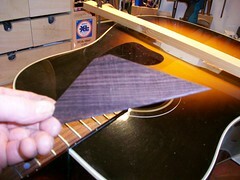 Whilst the glue is drying the soundboard is kept in its flatter shape. 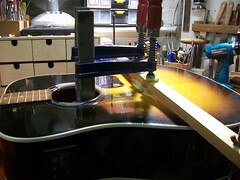 After a few days the guitar is strung up, tuned to concert pitch and monitored. Several days later all seems well. The shape of the soundboard has improved considerably. 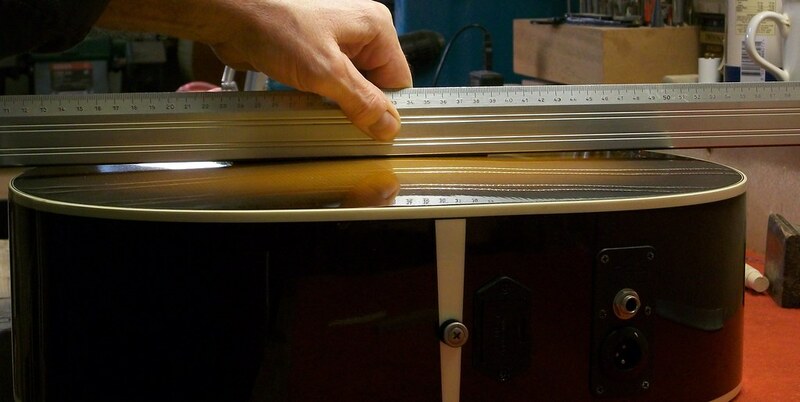 Although still in is Parabolic state it has become less extreme at the soundboard edges resulting in the bridge sitting slightly lower and thus giving a better playing action, better feel and better sound quality. The J 30 has improved considerably with the work that was carried out. It plays beautifully and now has that lush Gibson sound again. This repair was considered a success and the owner back in Spain was delighted. All that remains is to organise the shipping back to Valencia. The guitar arrived safe and sound yesterday and plays beautifully.